The GearWrench Ford A/C and Fuel Line Spring Lock Coupling Tool is designed for most ford vehicles that are equipped with spring lock couplings on fuel and air conditioning lines, and this necessary tool releases locking mechanism on all 4 sizes: A(3/4''), B(5/8''), C(1/2''), and D(3/8''). GearWrench yoke and screw swivel replacement part. GearWrench fuel pump vacuum and pressure tester. GearWrench pulley puller and installer set. GearWrench ford a/c and fuel line spring lock coupling tool. GearWrench fuel line quick disconnect tool. GearWrench ford fuel line coupling tool. GearWrench 4.9L ford fan clutch wrench. GearWrench pulley holder/fan clutch tool kit. GearWrench diesel fan clutch wrench. GearWrench ford 7.3L fuel filter tool. GearWrench low profile fuel line quick disconnect 5 piece set. GearWrench serpentine belt stretch tool. GearWrench serpentine belt grabber tool. GearWrench chrysler quick line disconnect tool. GearWrench GM transmission oil cooler line disconnect tool. GearWrench GM hydraulic clutch line disconnect tool. 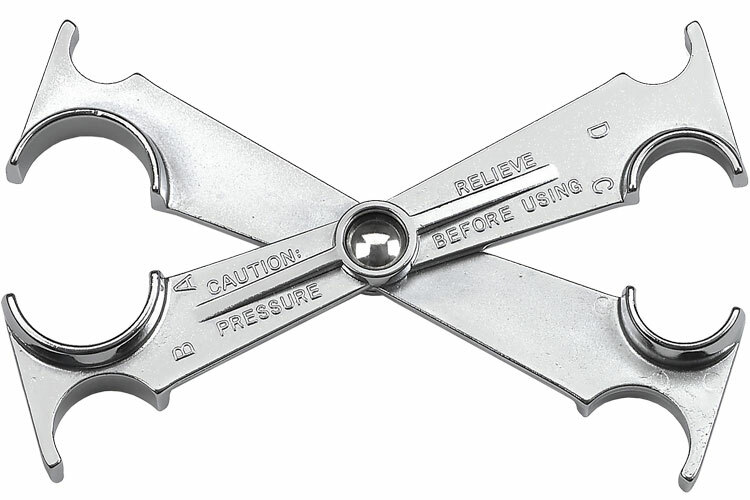 GearWrench ford auto transmission to radiator line disconnect tool. GearWrench 1/4'' black disconnect for fuel sizes. GearWrench 1 13/16 (29mm) 1/2'' drive oil sender socket. GearWrench 7/8'' slotted socket for PVS, TVS, and 02 socket. GearWrench 1 1/16'' 3/8'' drive deep oil pressure sending socket. GearWrench 7/8'' (22mm) oxygen sensor socket. The 3290D GearWrench Ford A/C and Fuel Line Spring Lock Coupling Tool is one of thousands of quality tooling products available from MRO Tools. Please browse GearWrench Fuel Tools for tools similar to the 3290D GearWrench Ford A/C and Fuel Line Spring Lock Coupling Tool. 3290D GearWrench Ford A/C and Fuel Line Spring Lock Coupling Tool description summary: GearWrench ford a/c and fuel line spring lock coupling tool. Quantity discounts may be available for the 3290D GearWrench Ford A/C and Fuel Line Spring Lock Coupling Tool. Please contact MRO Tools for details.